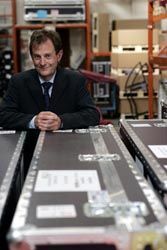 John Oakley, managing director of Klark Teknik's parent company, Telex Communications U.K.WORCESTERSHIRE, ENGLAND-The market for multi-channel digital audio distribution in performance spaces looks very different this month, after Klark Teknik announced it had bought the assets of the SuperMAC and HyperMAC audio networking business from Sony Oxford. SuperMAC technology is the basis for the Audio Engineering Society's AES50 standard for high-resolution, multi-channel audio connection. Klark Teknik says it will promote the use of AES50, SuperMAC and HyperMac, and will license the use of the technology. Support for existing licensees will transfer from Sony Oxford to Klark Teknik, and compliance with AES patent policy will be unaffected. John Oakley, managing director of KT's parent company, Telex Communications U.K., said: "SuperMAC and HyperMAC are by far and away the best networking technology for live performance use. They are totally deterministic with very low latency over multiple network segments, and offer very high reliability and redundancy. The high channel capacity, coupled with the ability to carry standard TCP/IP messages, cannot be matched by any other technology." Having played a pivotal role in developing the SuperMAC and HyperMAC standards, Sony decided it could no longer give its audio networking business the investment and focus it needed to migrate from the worlds of audio recording and broadcast to live and installed sound. Morgan David, divisional director of R&D for Sony Professional Solutions, siad it had become the company's "top priority to identify a new owner who would be committed to the development of the AES50 standard, both in terms of technological progress and also through active licensing and support to the industry as a whole." Telex, now part of Bosch Communications Systems, had already been among AES50's strongest supporters, with SuperMAC and HyperMAC being used extensively in the Midas XL8 digital mixing console to provide a highly flexible audio routing and distribution platform. The company says it will now develop further products using the technology, and the first of these, the DN9696 high-resolution live performance audio recorder, was previewed at the PLASA exhibition in London last month. Further product announcements from third parties are expected shortly. "We are proud to be the new owner and promoter of this exciting and practical technology," concluded Oakley. "It is particularly important that this is an AES standard, open to all."